Halloween is near, and you know what that means… time for some spooky crafts with the kids. Or, in this case, some not-so-spooky crafts. Some kids aren’t big on the spook factor (like mine). 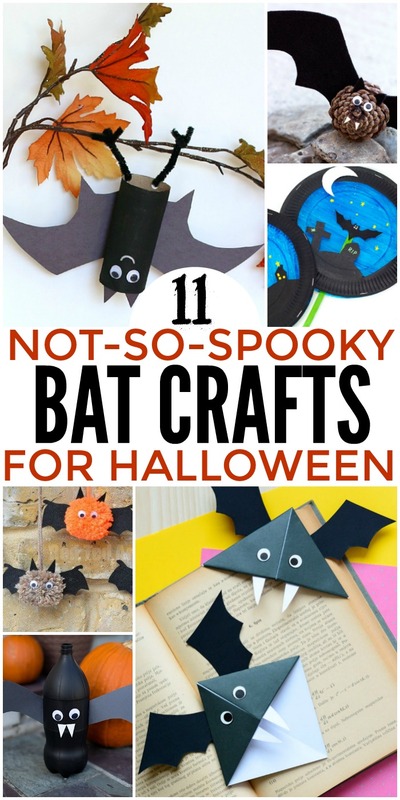 But these bat crafts are adorable, and they’re the perfect Halloween crafts for kids of all ages. Whether you need a simple craft for a toddler or preschooler or a cool idea for the older kids, you’ll find some scary good ideas here. Toilet roll crafts are our favorite because we always have them on hand. Add this hanging bat craft from Buggy and Buddy to your Halloween tree this year! Incorporating nature into your crafts is always fun. Kids will love the rough, bumpy texture of this pinecone bat from Fireflies and Mud Pies. This paper plate bat puppet from Kids Craft Room is so much fun because it moves! My son loves these crafts, so this is on our must-do list for Halloween. Do you have a Halloween tree? We’ve never done one, but we’re thinking about it. Just think how adorable these pom pom bats from Red Ted Art would be hanging from the branches! Turn a soda bottle into a fun Halloween decoration with this soda bottle bat craft from Kids Activities Blog. Won’t it look cute on your mantle? Keep your place in your favorite book of spooky stories with a bat corner bookmark. This project from Easy Peasy & Fun would make a cute non-candy classroom treat for Halloween, too. 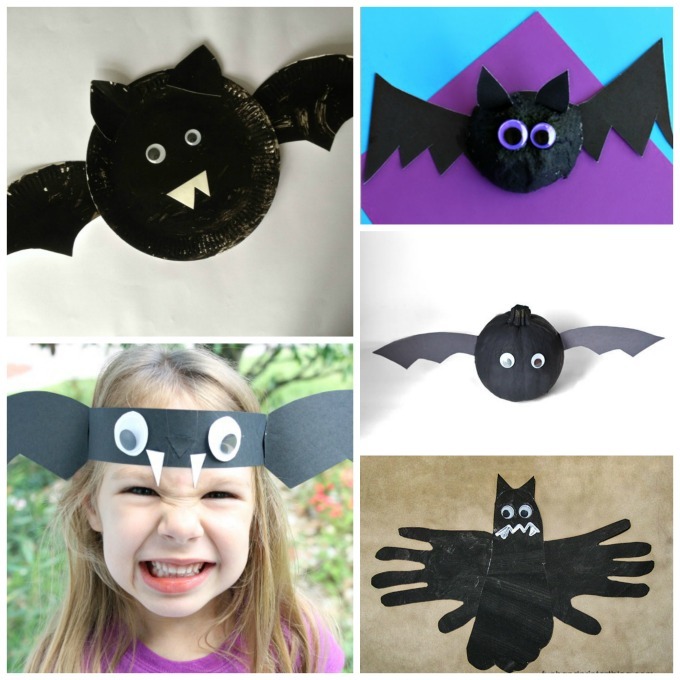 If you’re working with toddlers and preschoolers, these simple paper plate bats from Crafts on Sea are so easy to execute. Make a spooky headdress to sport on Halloween. This bat headband fits the bill! Recycle egg cartons into a cute craft like this egg carton bat. You can also make turtles, ladybugs, and loads of other things in other seasons. FUN! If you lack pumpkin carving skills, you’re not alone. That’s why we opt for painted pumpkins each year. This no-carve bat pumpkin from Glue Sticks & Gumdrops is super easy, so it’s perfect for toddlers and preschoolers. And finally, those hands and feet won’t always be so small. But while they are, try making one of these hand and foot vampire bats from Fun Handprint Art. You’ll smile at those little prints each year when you take it out for Halloween decorating.